There’s an inkling, not without merit, that Brave is Pixar Animation’s way of checking one more item—a strong female protagonist—off its canonical to-do list. Still, there’s a subtle subversion in the way the filmmakers discharge this distaff duty. The basic plot is the kind that Disney proper, Pixar’s parent company, has been churning out for decades: a winsome princess challenges authority in an effort to blaze her own path in love and life, forced to confront the curses of a Wicked Witch™ along the way. In Brave, however, there is no handsome prince waiting the wings or riding to the rescue. Indeed, there’s no man at all who ultimately proves the fairest of them all. There’s only a girl combating tradition and her matriarch on the way to self-determination. It’s a thumb to the eye of both the classic Disney cartoons of yore and their modern progeny that consistently proffer the paradox that a lady is truly free only once she’s living happily ever after with the right fellow. Princess Merida (Kelly Macdonald) is a teenage tomboy, a red-haired daddy’s girl who prefers galloping through the forest for archery practice over the customs of the 10th century court of DunBroch in the Scottish highlands. On Merida’s birthday, the heads of the three clans are invited to send their eldest sons to vie for her hand. 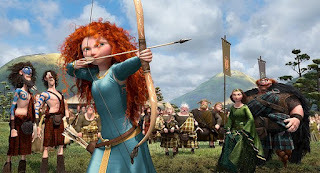 Merida chooses the competition—archery—then, as the oldest of the fourth tribe, proceeds to best her would-be suitors. The stunt doesn’t sit well with queen mum Elinor (Emma Thompson), causing a rift that sends Merida hurtling into the woods and the hovel of a woodworking witch (Julie Waters) with a penchant for bear-themed cuttings. Merida’s wish for a spell that will change her fate and her mother’s mind propels Brave into second stanza, a parable about the bond between mothers and daughters. As usual, Pixar’s animation is stupendously detailed, from the soaked fur of a fish-hunting bear to Merida’s flowing locks, as fiery as her personality. If only the characters inhabiting the pretty scenery, mostly a collection of Scottish tropes, were as three-dimensional as the visuals. Merida’s king dad Fergus (naturally) is voiced by Billy Connolly (naturally, although it’s a bit surprising this is Connolly’s first Pixar foray). Fergus is a rotund, ale-swilling oaf who exists chiefly to regale party guests with tall tales of adventure and, when necessary, exert a spite of bears born from the time one bit off his left leg. Merida’s suitors are a trio inbred dimwits who, along with their friends and relatives, posit easy Scottish stereotypes for laughs. The rest of the comic relief come compliments of Merida’s siblings, a trio of runty gingers whose hijinks quickly transition from funny to filler. And, there’s the conspicuous absence of a bona fide villain—even the witch comes across as less wicked than mischievous. Still, some content—notably several bear battles—may prove too dark and scary for the youngest viewers. Moreover, Brave is a victim of its maker’s own success. Cars 2 was Pixar’s first blatant misfire, but it was a bad movie by any standard. Brave exudes the charm and spirit of a outside offering like How to Train Your Dragon, but those expecting another Toy Story, WALL-E, or Ratatouille aspire to a high standard few films can attain. Viewers will have to make due with a handsome, entertaining folktale aiming for a girl power bull’s-eye. The irony is that co-director Brenda Chapman, one of the few female vets in animated filmmaking, was fired from Brave last year after spending six years making it. Still, if this Disney apocrypha changes the way you look at its cartoon princesses, all the better.